The most shocking disappointment of round 21 was a home defeat of second-best Satria Muda (8-7) to third ranked Bima Perkasa (9-6) 82-70 in the game for the second place. It ended the four-game winning streak of Satria Muda. It was a key game for the second position in the league. Bima Perkasa made 16-of-21 free shots (76.2 percent) during the game. Strangely Satria Muda outrebounded Bima Perkasa 46-34 including 20 on the offensive glass. They looked well-organized offensively handing out 23 assists. American guard David Seagers (188-88, college: Dowling) stepped up with a double-double by scoring 25 points, 8 rebounds and 13 assists for the winners and his fellow American import forward David Atkinson (203-91, college: Salem Intern.) chipped in 28 points and 6 rebounds. The best for the losing side was American forward Dior Lowhorn (201-87, college: USF) with a double-double by scoring 22 points and 13 rebounds. Satria Muda's coach rotated eleven players in this game, but that didn't help. Bima Perkasa have a solid series of four victories in a row. They moved-up to second place. Defending champion Satria Muda dropped to the third position with seven games lost. Another exciting game was a derby match between two teams from Bandung: Prawira (#5) and Siliwangi (#4). Prawira (5-9) won against visiting Siliwangi (5-11) 94-83. Americans were the main players on the court. Dalarian Williams (198, college: Life) nailed 31 points and 7 rebounds (on 13-of-17 shooting from the field) for the winning side and Brachon Griffin accounted for 15 points and 9 assists. 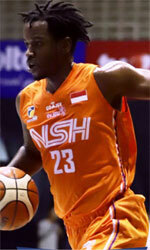 Prawira's coach Andre Yuwadi allowed to play the deep bench players saving starting five for next games. Forward Michael Vigilance (203-94, college: Clark Atlanta) came up with a double-double by scoring 35 points (!!!) and 15 rebounds for Siliwangi in the defeat. Prawira maintains fifth place with 5-9 record. Siliwangi lost fourth consecutive game. They keep the fourth position with 11 games lost. The game between Top Four teams took place in Pandang. 4th placed host Hang Tuah (6-9) lost to first ranked NSH (10-6) 83-71. The best player for the winners was Dashaun Wiggins who scored 24 points, 7 rebounds, 9 assists and 4 steals. At the other side the best for losing team was Jarad Scott who recorded a double-double by scoring 24 points and 14 rebounds. Both coaches used bench players which allowed the starters a little rest for the next games. NSH maintains first place with 10-6 record. Hang Tuah at the other side keeps the fourth position with nine games lost. Third ranked Pacific Caesar (6-10) crushed at home 5th ranked Satya Wacana (4-13) by 26 points 92-66, which is the biggest margin this round. Americans were the main players on the court also this time. It was a good game for Qarraan Calhoun who led his team to a victory with a double-double by scoring 25 points and 17 rebounds. Pacific Caesar's coach felt very confident that he used 11 players and allowed the starting five to rest. Pacific Caesar maintains third place with 6-10 record having four points less than leader Stapac. Satya Wacana lost fifth consecutive game. They keep the fifth position with 13 games lost. Another exciting game was a derby match between two teams from Bandung: Prawira (#5) and Siliwangi (#4). Prawira (5-9) won against visiting Siliwangi (5-11) 94-83. Prawira forced 19 Siliwangi turnovers. Strangely Siliwangi outrebounded Prawira 40-27 including 29 on the defensive glass. Their players were unselfish on offense dishing 28 assists. Americans were the main players on the court. Dalarian Williams (198, college: Life) nailed 31 points and 7 rebounds (on 13-of-17 shooting from the field) for the winning side and guard Brachon Griffin (185-92, college: Elizabeth City, agency: SDJ Sports) accounted for 15 points and 9 assists. Five Prawira players scored in double figures. Prawira's coach Andre Yuwadi allowed to play the deep bench players saving starting five for next games. Forward Michael Vigilance (203-94, college: Clark Atlanta) came up with a double-double by scoring 35 points (!!!) and 15 rebounds and point guard Martavious Irving (186-90, college: Kansas St.) added 23 points, 7 rebounds and 6 assists respectively for Siliwangi in the defeat. Prawira maintains fifth place with 5-9 record. Siliwangi lost fourth consecutive game. They keep the fourth position with 11 games lost. Third ranked Pacific Caesar (6-10) crushed at home 5th ranked Satya Wacana (4-13) by 26 points 92-66, which is the biggest margin this round. Pacific Caesar players were unselfish on offense dishing 24 assists. Americans were the main players on the court also this time. It was a good game for forward Qarraan Calhoun (203-86, college: Houston) who led his team to a victory with a double-double by scoring 25 points and 17 rebounds. Forward Jjuan Hadnot (190, college: Grand View) contributed with 18 points, 8 rebounds and 8 assists for the winners. Five Pacific Caesar players scored in double figures. Pacific Caesar's coach felt very confident that he used 11 players and allowed the starting five to rest. Guard Madarious Gibbs (185-93, college: Texas Southern) answered with a double-double by scoring 26 points, 10 rebounds and 5 assists and forward Raymond Miller (204-88, college: CS Fullerton) added 11 points and 11 rebounds in the effort for Satya Wacana. Pacific Caesar maintains third place with 6-10 record having four points less than leader Stapac. Satya Wacana lost fifth consecutive game. They keep the fifth position with 13 games lost. The game between Top Four teams took place in Pandang. 4th placed host Hang Tuah (6-9) lost to first ranked NSH (10-6) 83-71. NSH looked well-organized offensively handing out 26 assists. The best player for the winners was American guard Dashaun Wiggins (188-91, college: Portland St.) who scored 24 points, 7 rebounds, 9 assists and 4 steals. His fellow American import power forward Anthony Simpson (202-87, college: Kent St.) chipped in 7 points, 13 rebounds and 4 assists. At the other side the best for losing team was American forward Jarad Scott (203-95, college: Union, TN) who recorded a double-double by scoring 24 points and 14 rebounds and guard Abraham Wenas (175-96) added 27 points respectively. Both coaches used bench players which allowed the starters a little rest for the next games. NSH maintains first place with 10-6 record. Hang Tuah at the other side keeps the fourth position with nine games lost. The most shocking disappointment of round 21 was a home defeat of second-best Satria Muda (8-7) to third ranked Bima Perkasa (9-6) 82-70 in the game for the second place. It ended the four-game winning streak of Satria Muda. It was a key game for the second position in the league. Bima Perkasa made 16-of-21 free shots (76.2 percent) during the game. Strangely Satria Muda outrebounded Bima Perkasa 46-34 including 20 on the offensive glass. They looked well-organized offensively handing out 23 assists. American guard David Seagers (188-88, college: Dowling) stepped up with a double-double by scoring 25 points, 8 rebounds and 13 assists for the winners and his fellow American import forward David Atkinson (203-91, college: Salem Intern.) chipped in 28 points and 6 rebounds. Four Bima Perkasa players scored in double figures. The best for the losing side was American forward Dior Lowhorn (201-87, college: USF) with a double-double by scoring 22 points and 13 rebounds and international forward Jamarr Johnson (193-88, college: Widener) scored 11 points, 8 rebounds and 5 assists. Satria Muda's coach rotated eleven players in this game, but that didn't help. Bima Perkasa have a solid series of four victories in a row. They moved-up to second place. Defending champion Satria Muda dropped to the third position with seven games lost.